Landscaping and planting season is nearly here, and you may need high-quality topsoil to level out low spots in your lawn and fill the bottoms of your raised bed gardens. So, what type of topsoil should you purchase? How can you identify topsoil that’s tops in quality? For lawn and garden success, look for one that meets the following conditions. When you compare topsoil from different sources, you’ll notice that they can differ dramatically in color. Generally speaking, lean toward darker shades – anything from coffee-colored to almost-black. Rich, dark tones indicate a high level of organic matter, and the more organic material present, the greater the concentration of nutrients. Conversely, lighter shades show a lack of the nutrients plants need to grow healthy and strong. 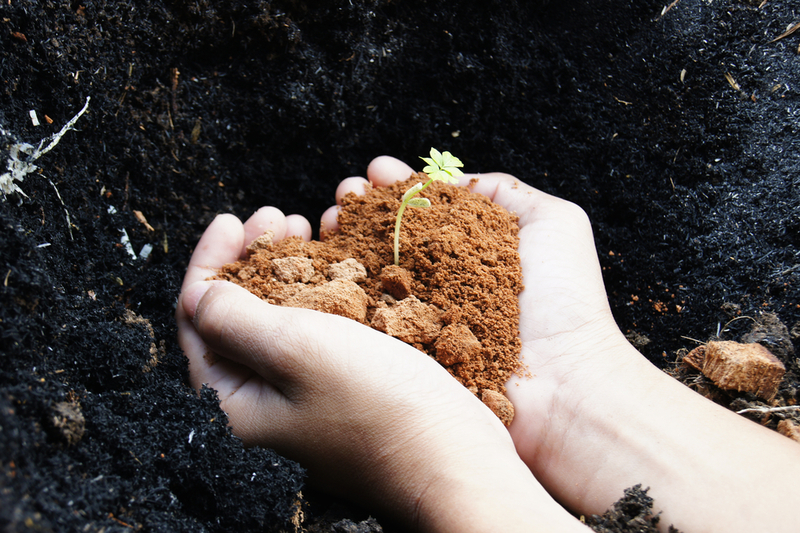 High-quality topsoil should crumble easily between your fingers and feel slightly gritty – the loose texture is another sign that it’s rich in organic matter. When topsoil is too hard to crumble or forms into a clump when you test it out, it likely has too much clay. A high clay concentration can prevent an adequate amount of water and air from reaching the roots of any plants placed in it. And when plants don’t get what they need, they begin to decline in health. Screening is another important characteristic to look for when shopping for topsoil. Screened topsoil is sent through a mesh grid during manufacturing to ensure a consistent particle size. With unscreened versions, there may be a mixture of small and large soil particles – and that doesn’t make for an ideal growing medium. Worse, unscreened topsoil can lead to plant root rot. Screening, on the other hand, allows for better nutrient delivery and natural water flow, both of which help boost plant growth. You can find topsoil at home improvement stores and garden centers, but why spend time hunting a high-quality screened version down and doing all the heavy labor to get it to your home when an easier option exists? Some local landscape material suppliers – including The Dirt Bag here in northern Utah – will deliver affordable, top-notch topsoil to your property and unload it to the spot you specify. Whether you buy in bags or in bulk, this is a simple, cost-effective option. The Dirt Bag, based in West Jordan, delivers bulk and bagged topsoil, garden mulch, organic compost, soil conditioner and all of our other landscape materials throughout Salt Lake County for free. And, our fee for delivery to the surrounding northern Utah communities is quite low. For more information, or to schedule delivery of high-quality topsoil and any other landscape material you may need, contact The Dirt Bag today.